"We wanted to live in a place that could feed us: where rain falls, crops grow, and drinking water bubbles up right out of the ground." 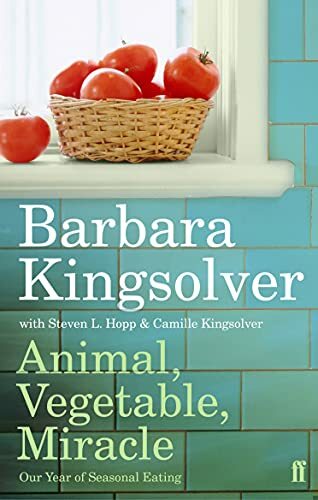 Barbara Kingsolver opens her home to us, as she and her family attempt a year of eating only local food, much of it from their own garden. "We wanted to live in a place that could feed us: where rain falls, crops grow, and drinking water bubbles up right out of the ground." Barbara Kingsolver opens her home to us, as she and her family attempt a year of eating only local food, much of it from their own garden. Inspired by the flavours and culinary arts of a local food culture, they explore many a farmers market and diversified organic farms at home and across the country. With characteristic warmth, Kingsolver shows us how to put food back at the centre of the political and family agenda. Animal, Vegetable, Miracle is part memoir, part journalistic investigation, and is full of original recipes that celebrate healthy eating, sustainability and the pleasures of good food.